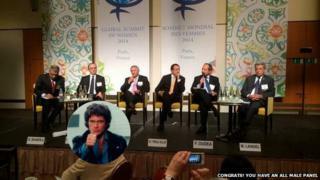 Now one website is pointing out this phenomenon by publishing photos of all-male panels, or "manels". The site is a Tumblr blog, sarcastically called, Congrats! You Have an All-Male Panel. Whether it's a Global Summit of Women with only men on the panel or back-to-back male panels in conferences, the images on the site bring home the message that gender equality among rostrums of leaders or experts is in short supply. The most distinctive part of the Tumblr blog is a stamp added to every submitted panel. It's a photo of a picture of David Hasselhoff, the American actor, best known for his lead roles in the popular US TV series Knight Rider and Baywatch. Image caption Sarma considers it a double whammy if the panels are all-male and all-white. There's no indication that the Hasselhoff actually endorses all-male panels, instead Sarma says: "He just epitomises white masculinity especially in his '80s Knight Rider appearance, a lone white man saving the world with a help of a car. I grew up watching Knight Rider so I do have some kind of fondness for the Hoff." Sarma believes the stamp is partly what has made the blog popular. "This is such an enraging and sad thing, but to be able to laugh at it is truly empowering for many people," she says. Sarma points to many other efforts to call groups out on the "manel" phenomena including the Twitter accounts of watchdog group @EUPanelwatch and @genderavenger, public forums like Foreign Policy Interrupted and websites manpanels.org and that of Owen Barder, the Director for Europe at the Centre for Global Development, who is encouraging male experts to take a pledge not to appear on all-male panels. "I think it is always very small steps that we take towards equality, so I don't dare to hope that manels would stop altogether, but if this makes people to think about diversity more seriously and at least some people commit to not organising all male or all white panels, I'd be very happy," Sarma says. "I'd be very happy if I never saw any of my colleagues on an all-male panel again." Next story: Where did Charlie Charlie Challenge come from?